There are many pathways to creating great children. Great people can sometimes rise from the worst possible parenting and have an everlasting positive influence on people around them. Take Joyce Meyer, for example, who was abused all her life but has become one of the most trusted sources in the Christian community and invests time in showing women how to break boundaries. She is a true hero; I learn from each message she delivers. Abuse is definitely not the correct way to parent, however, and most people that are put in those situations as children abandon their parents and live lost lives restricted to their memories of affliction and torment. On the flip side, my wife is an awesome human being. She encourages our children and shows them what it is to love through service, affection, and doing things that are fun for them. Just before our first son Clay was born, she wanted to display why I was going to be a great father. I was really moved. Each of us can learn from my wife’s words and soak up the different things that we ought to do to be awesome fathers. Having a servant’s heart is huge, praying for your family, undeniably important. Making your wife a priority each and every day, and openly communicating schedules and desires is an absolute must. There is no doubt that her words of wisdom run deep, and a preacher could make a sermon (or even a series of sermons) on each point. I encourage you to go through the list one more time but replace “you” with “I”. See how it transforms you into a better mindset. Walking through this list at least weekly will definitely keep my priorities straight with my family. 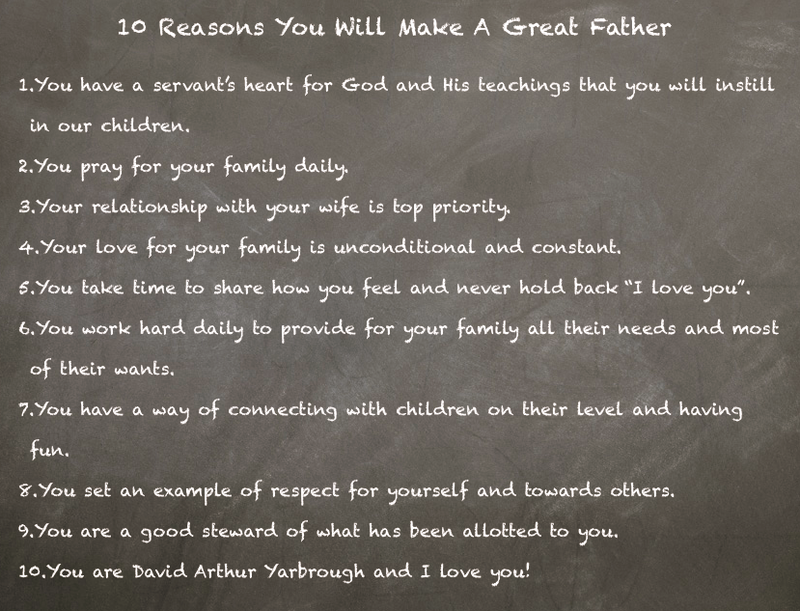 Numbers 1 through 9 are reasons that any man would make a great father. The one reason that motivates me the most, however, is #10. The reason that I am a great father to my children is because I am me. Simply put, there is no substitute for who I am. There are only a couple of roles in my life in which there is absolutely no substitute, being a husband to my wife and a father to my kids. In a life full of demands from outside circumstances that seem to pull us away from the family, we have to decide on how we are going to spend our time. And if we find ourselves spending less and less time with our family, our family is growing without us, apart from us. We have to make a lifestyle decision so that our family is a priority, not the leftover. Family time is absolutely crucial to growing together into one unit. You can be replaced in any position you have on earth. If you’re a teacher like me, there is another teacher out there that can replace you. If you’re a coach, replaceable. Even if you are doing the Lord’s work and must be away from home to spread the word of the gospel, you are replaceable. The only unique roles that you have in your life is that you are a husband to your wife and father to your children. Even God in Heaven does not want you to claim someone else as Daddy. We are jealous of that title and rightly so. I urge you to please take time to watch and/or listen to this thirty minute message from Andy Stanley on making Breathing Room (Part 4 of series). If you don’t have 30 minutes, you can always download the podcast through your phone and listen on the way to work. So what are you going to do, Daddy? It’s time to make priorities in your life. Is your wife a priority? She loves you because she wants to. Your kids love you because they want to. They are pulling for you to be a dad who has great influence on them. They want you to support them and to make family time as important as making a dollar. Family time is more important than nearly any other event that I can name. Don’t cover up family time with television; kick the thing off. There is no substitute for you in your role as a father. I, just like all of us, am working on prioritizing my life and have some accountability to make sure that it happens. I encourage you to do the same. I encourage you to leave a comment below to let me know what you will do (or what you have already implemented) to make family time a priority. As I stated, I am still figuring out how to balance work and family time so seeing your comments will benefit me as well. Let’s learn together. This entry was tagged andy stanley, awesome, children, dad, daddy, family, family time, father, great, husband, joyce meyer, priority, wife. Bookmark the permalink.